The Bicycle Garden: I have been to the mountain top, and it was made of goat cheese. I have been to the mountain top, and it was made of goat cheese. Look at these lovely ladies! It is true that they are all dolled up with those pretty blue collars, but don't be fooled. Once a day they roll up their sleeves and get down to business at Haute Goat Creamery, an artisanal cheese-making operation I had the very good fortune to visit on Friday, right here in LBB. And friends, my culinary life has been ruined forever. I have been to the mountain top, and back here on planet Earth nothing will ever taste as sweet again. You think you know goat cheese? Ha! I respectfully submit that you have never tasted goat cheese like this. 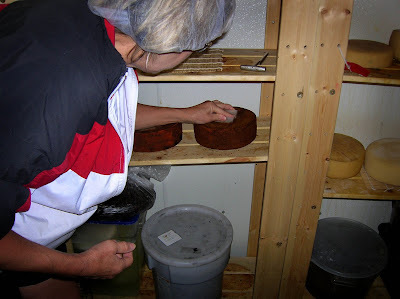 Owner and cheese-maker Nancy Patton gave me some little niblets to try and I was transported. The flavor simply blossomed in my mouth. And the variety! Goat blue cheese. Goat yogurt. Goat cheddar cheese. Goat cheese with black olives nestled inside...Award winning cheeses, all. 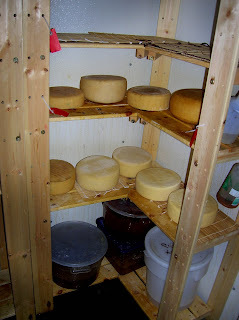 Here's picture of some of the many hard cheeses being aged. And here is another of Nancy scraping some Tequila Abbey, a cheese soaked in tequila, and chipotle, and...uh, I didn't hear anything after she said tequila and chipotle. I was too busy thinking about that smoky goodness and wondering how I could smuggle one of those wheels out of there without her noticing. 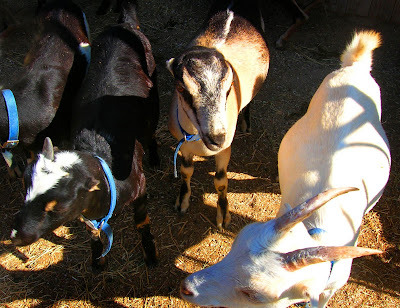 Sadly for us, Haute Goat cheese is not sold in the grocery store. Nancy sells primarily to high end restaurants, including--good news!--a few here in town. She can also make some up special order, just for you. Here's her website for the details. And now I want goats to go with my chickens and bees.